Quick test: If you wanted to change the temperature in your house, would you have to get up off your couch? Probably. What about if you want to adjust your thermostat when you weren’t even home? Could you do it? Probably not. But you could with an Ecobee thermostat. 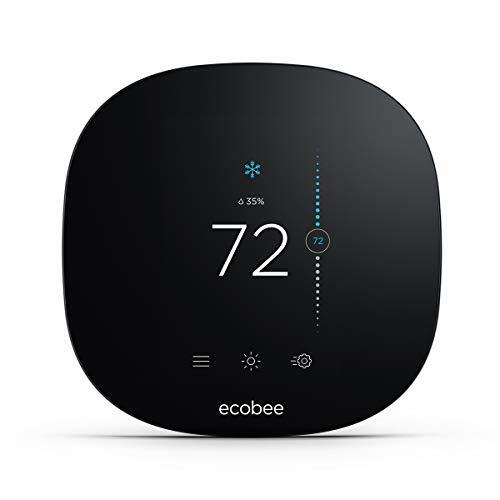 Of course, you are going to want one of the newer versions in this line of products, so you’ll be choosing between the Ecobee3 Lite and the Ecobee4. But now how exactly, do you decide? Don’t worry; we’re here to help. We’ll tell you what makes these two products similar and different as well as which one is more suited to your needs. Savings: With the Ecobee4, your smart home will save an average of 23% on heating and cooling costs, just like with the Ecobee3. These savings could easily pay for your thermostat purchase. Room Sensor Included: Similar to the previous iteration of this product, the Ecobee4 can utilize room sensors to better get a feel for the temperature of different rooms in your home. However, the Ecobee4 builds on this ability by giving you one room sensor with the price of the thermostat itself. Command from Anywhere: This smart home appliance connects to your home’s Wi-Fi, giving you the ability to connect to it via an app on your Android or iOS device. Because of this, you can set your thermostat from anywhere. A beautiful part of your home: Let’s face it. Most thermostats are just plain, old ugly. But this is not an issue for the Ecobee4. This lovely looking touchscreen interface looks like it jumped out of the future, right onto your wall. 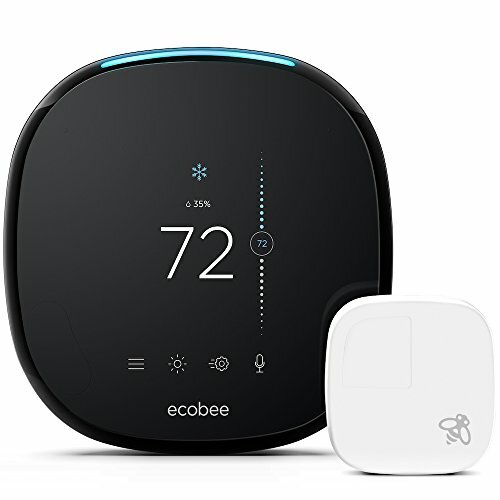 Accessory support: The Ecobee 4 can connect to humidifiers, dehumidifiers, and ventilators, to provide further comfort to your home. Warranty: This Ecobee product comes with the same 3-year customer install warranty that its predecessor employed. With this included in your thermostat purchase, you’ll have no worries for years about the comfort of your home. Savings: Save an average of 23% on your home’s heating and cooling costs because of the intelligence of this thermostat. Your home will know when it needs to be heated or cooled because of the cloud connection that lets it know a variety of factors. Compatibility: Well-suited for most residential heating and cooling systems. This includes conventional, heat pumps, gas, oil, and electrics, and has duel fuel support. Control from Anywhere: Via your Android or iOS device, once your thermostat is connected to your home’s Wi-Fi, you will be able to operate it from wherever you may be. Automatically Anticipates Environment: The Internet connection also allows the gadget to adjust to the local weather, your schedules, and desired settings. With this information, your thermostat will know when it needs to work hardest – or not at all. Adjust in Separate Rooms: The Ecobee3 can operate with room sensors. These sensors can be set up in specific rooms that you feel are often not exactly the right temperature that you are looking for and have your thermostat account for the difference. The room sensors are sold separately, though. Alexa Voice Control: Best of all, this thermostat can be connected to an Amazon Echo. With this connection, the thermostat has access to Alexa Voice Control, meaning you can set the temperature in your house using just your voice. Warranty: To make sure that this thermostat would be a reliable investment for you, this unit comes with a 3-year customer install warranty. All told, the Ecobee3 is an awesome addition to your smart home, adding comfort and ease to your life. There are a few notable similarities between these two products – and they’re all good. Both of these thermostats offer an average of 23% of savings on your home’s heating and cooling costs, something anyone could enjoy. They also both feature the same 3-year warranty on customer installed units so there would be no need to worry about your thermostat for years to come. Additionally, they both can be controlled from wherever you are through your phone, letting you create a comfortable environment in your home, even when you aren’t there. So, yes, there are many similarities between these two products, but there is no doubt that you will be thankful for these excellent features with either purchase. Alexa Voice Service: This is the biggest difference between these two products. As the newer product, the Ecobee4 sports the advantage of having Alexa enabled right in its interface. This means you can get to Amazon’s cloud virtual assistant and access all of her impressive skills, even without an Amazon Echo. The Ecobee3 simply does not, although it can be connected to an Amazon Echo for Alexa’s voice control. Room Sensors: While both the Ecobee3 and Ecobee4 can be configured to use room sensors; the Ecobee4 has the added benefit of a room sensor built right into its purchase. Price: Yes, the newer version costs more. The Ecobee4 is on the higher end, costing around $70 more than the 3. However, it should be noted that the cost of the Ecobee4 gets you access to Alexa as well as a room sensor included in the purchase. Truly, it is personal preference whether or not the price is right for you. These three differences are the keys to deciding whether you should be buying an Ecobee3 or an Ecobee4. The price of the products might just be what leads your decision, as this is an actual situation of getting what you pay for. These two products are, in truth, quite similar. However, the higher price tag for the newer version reveals the couple of added functions that should decide what you want out of your new smart thermostat. If you intend to use a room sensor in your home, the two pack of sensors that you can buy are worth $75. So, the difference between the prices of these products are covered by the sensors alone. The bigger difference here is that the Ecobee4 also has Alexa built right into it and should be a heavy consideration to you as a buyer. If you aren’t trying to get Amazon’s virtual assistant in your home, then the Ecobee3 is probably the quick and easy choice for you. It could also be that you already have an Amazon Echo, so you have access to Alexa and may not need the fancier thermostat. 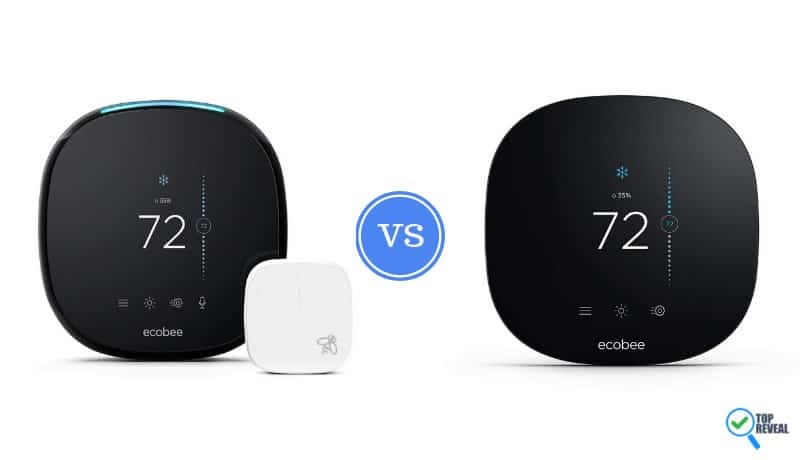 The Ecobee3 again seems to be the natural choice. However, if you do want access to Alexa that you don’t already have (or maybe you do have an Echo and just want to be able to put Alexa in another space in your home), the more expensive option should be calling you. The benefits that Alexa brings to your home are amazing and make you feel like you stepped into the future every time you come home. With Alexa, you’ll be able to control your thermostat with just your voice, have Alexa read you the news, or order your favorite pizza from Domino’s. So, the clearest difference here between these two products is the ability to add Alexa to a space in your home. So, who is the winner here in the matchup of the Ecobee 3 thermostat versus the Ecobee 4 thermostat? Well, whichever you choose! The selling point of the Ecobee4 is that it has Alexa built right into it. If this appeals to you, then the Ecobee4 is the winner to your mind. You shouldn’t mind paying more for it considering that buying an Amazon Echo to get Alexa in your home is another investment entirely. However, if you don’t care about Alexa access in your thermostat, then the Ecobee3 is your choice. The combination of simplicity and intelligence that this product offers is unmatched by its competition. All told, you are the judge in this showdown and are sure to love whichever product that you opt for.